Our students keep teaching other people the victorious wise remedies developed by our Institute. No doubt, wise victorious remedies must be based on true knowledge, not on oversimplified slogans. Unfortunately everybody keep screaming groundless slogans and refuse to learn ANYTHING about statehood law and about wise victorious remedies developed long time ago. Therefore for over 40 years Israel is constantly suffering from horrible strategic losses. Terribly illiterate Jewish lawyers set up Israel as a non-sovereign state, as an instance which is completely dependent from UN's opinion. For example, even in Israeli Declaration of Independence, six times (!) they made the entire rights of Israel to exist dependent from the UN's opinion. And it is only a beginning of a very long list of terrible betrayals of all Jewish officials and lawyers. Not even one of them ever objected these killing Israel betrayals! Their falsifications and perversions of Mandatory Law is in the middle of all the betrayals of Israel. ALL Jewish lawyers love to talk about Mandate for Palestine, but they ALWAYS cheat you regarding Mandatory law or they are completely illiterate in the law. So all Jewish lawyers and officials traitorously consider Jewish Mandate for Palestine http://NYMEI.org/jewish-mandate-for-palestine.html as not Jewish, but British. As the direct result of such betrayal, nobody can use Jewish Mandate for Palestine for defending Israeli soldiers and generals in the courts, for defending Jerusalem, for defending the whole Israel. All official Jewish leaders, all their lawyers and professors keep performing these killing Israel betrayals and keep oppressing the real specialists who can defend Israel (the people and the land) with complete certainty. Just take a look at the website of Israeli Ministry of Foreign Affairs - they insist that Mandate for Palestine is NOT Jewish, but British. Take a look at the website of Knesset - you will see the same terrible betrayal of Israel. Take a look at the Jewish Agency «Sochnut» website, at Israeli Justice Ministry website, at all other official websites - they all perform this terrible killing Israel betrayal despite of over 10 years of our teachings via books, via radio and TV channels; despite of the classes I gave to many Knesset members personally. Instead of learning, instead of defending Israel, instead of having scientific conversations, all these official traitors (leaders, lawyers, historians, etc) behave very malicious, as all ignoramuses usually do. So it is very hard for my students to talk to these official ignoramuses and traitors. This work is written specifically to help my students (and all honest people) to overcome mass-betrayals of these psycho-suicidal official traitors. First of all you have to learn how to reveal all killing Israel disinformation that is propagated everywhere by Jewish traitors - professors and lawyers(*). To explain at least something to such complete idiot you can use definitions from legal dictionaries. Below you will see blueprints that I have made from the classical legal dictionaries. And I also prepared complete summary from all legal dictionaries. My summary includes terminology in five most needed languages - British English, American English, French, Spanish and, of course, Roman law Latin. 1) Mandate (En); Mandat (Fr); Mandato (Sp); Mandatum (Lat) - The Contract. 2) Mandatory, Mandatary, Mandatee (En); Mandataire (Fr) Mandatarius (Lat) - The Employed party (the employee). 3) Mandant (En,Fr), Mandator (En); Mandans (Lat) - The Employing party (the employer, the boss, the owner). 1) A contract is usually named by the type of the contract. In this case it is clearly attributed as a mandate - «Mandate for Palestine» (En) and «Mandat pour la Palestine» (Fr). 2) The employED party ("His Britannic Majesty" and "His Britannic Majesty's Government" in this case) is usually named by its position - the Mandatory (Mandatary, Mandatee, Mandataire, Mandatarius). 3) The employING party (the Jews in this case) is usually named directly by its name. So usually there is no reason to mark that this party is the Mandant (Mandator, Mandans). If your interlocutor claims to be "PhD in History and in other related professional fields" - then he MUST know that. If he/she doesn't have even that absolutely required base knowledge - then he/she is not a specialist, not a professional, but fake bureaucratic PhD, another illiterate functionary who keep usurping (or even stealing) people's money. To perform that kind of crime they always oppress the real specialists. Unfortunately all Israeli professors, lawyers and officials are these illiterate functionaries who perform a lot of criminal activities in oppressing the real specialists and in usurping (stealing) people's money assigned for defending Israel. Not even one individual with the knowable in Mandatory Law ever existed among all Jewish lawyers, historians and official leaders... That is very sad, but it's the only truth we have. Unfortunately the only existing true professional specialists are the specialists of our New York Middle East Institute. So you, Israeli people (Jews and non-Jews), must send all Israeli professors, lawyers and officials to study and to take examination in our institute. 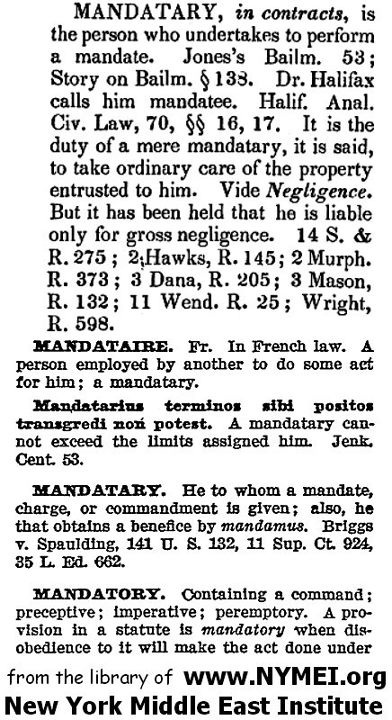 Basic definitions can be learned for example from p.754 of Henry C. Black «Law Dictionary Containing Definitions of the Terms and Phrases of American and English Jurisprudence, Ancient and Modern, 1910 Second Edition: And Including the Principal Terms of International, Constitutional, Ecclesiastical and Commercial Law» - http://Amazon.com/dp/1886363102 . My blueprint from p.754 of this of $195.00 book is presented on the bottom part of the picture below. In more details it can be learned from p.117 of the 2004 edition http://Amazon.com/dp/1584773588 of the CLASSICAL from the year 1843 (adopted to US in 1914, first published in 1839) John Bouvier «A Law Dictionary: Adapted to the Constitution and Laws of the United States of American Union; with references to the civil and other systems of foreign law». My blueprint from p.117 of this of $250.00 book is presented on the top part of the picture below. 1) "Mandatarius terminos sobi positos transgredi non potest" (Lat) which means in English "A mandatory cannot exceed the bounds of his authority". Jenk. Cent. 53. 2) "Mandatum nisi gratuitum nullum est" (Lat) which means in English "Unless a mandate is gratuitous, it is not a mandate". Dig. 17. 1. 1. 4; Inst. 3. 27; 1 Bouv. Inst, in. 1070. Both of these classical Roman law Latin definitions also prove very clearly that "His Britannic Majesty" and "His Britannic Majesty's Government" (the Mandatory) is NOT the owner of Mandate, that Mandate for Palestine is not British. The second definition also shows very clearly that it is illegal for Britain to get any kind of benefits, or any kind of revenue, or any kind of ownership of the Mandate. In couple of days I'll provide you with copies of all these pages (I'm too tired and too sleepy to scan them right now I'm too tired even to complete all the explanations). Unfortunately not even one knowledgeable specialist ever existed among official Jewish lawyers and leaders. They all proved themselves as terribly illiterate idiots and traitors, who even right now keep repeating killing Israel disinformation prepared by the most dangerous enemies like British «Special Operations Executive». This part of MI6 was switched from dirty operations against Nazi to even dirtiest operations against Jewish Holocaust survivors and against Jewish Palestine. This switch from Nazi to subversive activities against Jewish Holocaust survivors was performed in 1946 by Chief of MI6 Sir Stewart Menzies personally. - All these suicidal things were planted via ignoramus Jewish lawyers, professors, and brainless official leaders. British highly experienced saboteurs and spies from «Special Operations Executive» were very effective even against Abwehr, Gestapo and Sicherheitsdienst (not to mention Italian, Romanian and Japanese secret services). So they manipulated very easily with people like Menachem Begin and other stupid Jewish lawyers and leaders. It was «Special Operations Executive» (SOE) who created and promoted all Israeli big mouth "strong leader" idiots who even right now keep pushing through all the suicidal things like statements that Mandate for Palestine is British, not Jewish (as well as many other psycho-suicidal things). 1/1000 of these experienced operatives were more than enough to screw everything, including all textbooks in all Jewish universities. From February 14, 1947 Britain launched a well financed «Operation Embarrass» against the Jews. It was sanctioned directly by British Colonial Office and the Foreign Office, as well as by MI6, and the armed services. The Operation Embarrass team was told that "the primary consideration was to be that no proof could ever be established between positive action against this traffic and His Majesty’s Government [HMG]." The operation had three aspects: direct action against refugee ships, a "black" propaganda campaign, and a deception scheme to disrupt immigration from Black Sea ports. A team of former Special Operations Executive agents - with the cover story of a yachting trip - was sent to France and Italy with limpet bombs and timers. If captured, "they were under no circumstances to admit their connection with HMG" but instead claim to have been recruited in New York "by an anti-Communist organization formed by a group of international industrialists, mainly in the oil and aircraft industries," i.e. to lay the blame on rich, right-wing, unnamed Americans. They were told that this cover "was their final line of defense and, even in the event of a prison sentence, no help could be expected from HMG." But the most terrible part was mass planting of killing Israel disinformation via stupid Jewish lawyers, historians and leaders. (*) Unfortunately ALL Israeli lawyers, historians, officials and professors are easy to bribe and terribly illiterate (not even one exception is known up to now). That illiteracy and greediness of all Israeli functionaries are widely used by the dirtiest parts of British Secret Services (such as SOE) in their massive fight against Israel. I'll provide a lot of facts and particular details at the end of this work, after teaching Mandatory Law and after educating you in Jewish Mandate for Palestine.